5th grade students study composition using Garritan, GarageBand, and Finale. Photo courtesy of Marshall Shaw. March is Music in our Schools Month, and we’re delighted to welcome educator Marshall Shaw to the Garritan blog. Today Marshall tells us how he uses Garritan libraries in partnership with programs like GarageBand, Logic, and Finale, to enhance his lesson plans for music students. I want my students to engage with music in a way that is relevant, powerful and meaningful. 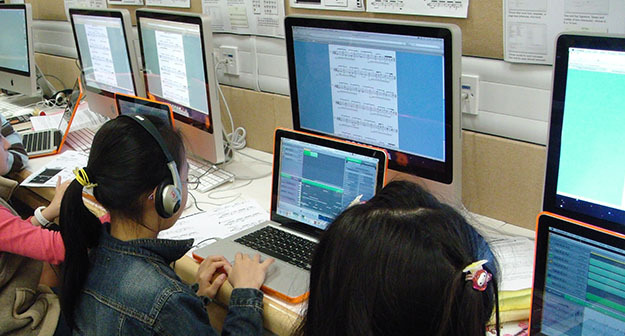 Apps and computer technology allow students to interact with the various elements of music in such a rewarding and profound way. With the help of technology like Garritan in the classroom, abstract concepts now become visible and tangible. Creating music has been one of the strongest motivators for student involvement and achievement, especially when driven with technology. Authentic instrument samples and mobile recording ability allow students to achieve impressive results with a basic level of experience with music notation and digital audio workstation software. Finale and Logic Pro can both use Garritan libraries to produce music in any style that is artistically rich and satisfying. As an educator, I see the value of using Garritan libraries to enhance my teaching. I also see the impact these sounds have on my students’ musical endeavors. Students use a variety of Garritan instruments to set up a round in 2, 3 or 4 parts. Students produce duets or trios for contrasting instruments, and/or clefs, and use Garritan instruments to listen to their compositions. I use Garritan to introduce students to the families of the orchestra by composing similar pieces as above. For example, a string duet, violin and cello, or trumpet, horn and tuba trio – Garritan gives the user the freedom to experiment with combinations of instruments. I use Garritan to demonstrate the sound of a variety of instrument articulations and techniques like trills, tremolos, pizzicato, and string harmonics. From this, students and I modify simple melodies with articulations and listen to the contrasting final products. For example, we’ll apply legato first, then staccato, and discuss how the same melody has changed in character. I teach my students simple composition techniques to create soundscapes for effect. For example, we blend instruments, use instrument overlays, clusters, rips, glissandi, and attacks. We use Garritan samples to listen to the soundscape we’ve created compositionally. We also use a variety of Instant Orchestra combinations and blending textures to explore orchestration and tone color, especially when writing with video in Finale. I use Garritan World Instruments to explore the sounds of world instruments with my students. For example, we practice writing in a variety of scales and modes typical of regions of the world, like pentatonic, music using the Chinese Bawu and percussion. My students practice writing in the theme and variation form. They represent each variation with a different instrument. Garritan assists my students in learning about instrument range, how the timbre changes in the extreme registers of each instrument, and how composers use these extreme registers for evocative effects. I’ve found that using free midi files of popular pieces and classical repertoire to study orchestration, harmony, and historical performance practices, can be very motivating for my students. Using an existing midi file as a base saves time in note entry so we can move onto blending instruments and listening to our final results faster. Midi files can be altered with any sound library patch for re-orchestrating and arranging lessons. Students can even play the solo part of a concerto or solo piece midi file, or listen to authentic performances from their computer. They can adjust tempo for practicing, modify the instrument, or change it. My students love to use sound libraries like Garritan to create their own ringtones for their mobile phone. Thanks to all the Garritan Blog subscribers for letting me share the joy Garritan Libraries have brought to my musical and educational life. I’d love to share more ideas and lesson plans for using technology in the classroom. Leave me a comment below. Marshall currently resides in Hong Kong. He has 27 years of classroom teaching experience, and is the founder and owner of Expressivo, a consulting firm for technology, education, and music. Visit Marshall Shaw’s Blog and stay up to date with his musical endeavors. Listen to original music by Marshall Shaw here, and visit his SoundCloud page to hear more!